As per last Monday’s post winter is starting to settle in pretty good in the Northeast’s zone 5b. This will be our first full winter in our new property, and I’m already starting to see where my winter landscape needs some help. Many people avoid winter landscapes, summer/fall color is gone leaving only browns, greys, and white, plantings are virtually impossible, and it’s dark all the time. Well not me, I’m already looking at ways to improve my winter landscape. With careful planning in the spring, summer, & autumn months you can put together a fantastic winter landscape. By using trees & shrubs, perennials, and hardscapes you can brighten up those dark winter days! All this said, I’ve put together a few tips & ideas below that will hopefully help you enjoy your landscape through these cold winter months. There are many trees and shrubs that offer interest in the winter months. You should focus on 3 main things while planting trees and shrubs during the planting season, foliage, fruits & berries, and bark. I think we all will agree when we think winter foliage we think evergreens. Evergreen trees like the white spruce, Douglas fir, Colorado blue spruce, and white pine, offer splashes of green and blue-green hues against the white winter background. There are also many evergreen bushes available as well; two of the most popular are the Korean boxwood, and the Bar Harbor Juniper. So when it comes to winter foliage evergreens should be on your “to plant” list. If you prefer a bit more color for your winter landscape you should be thinking berries. One of the best options for winter color are trees in the crabapple family. Some popular crabapples varieties that offer winter color are, the Adirondack, Centurion, Louisa, Prairifire, and Snowdrift crabapples. These trees not only offer scarlet, gold or orange colored fruit, but they also add texture to the landscape with their sprawling, twisted branches. 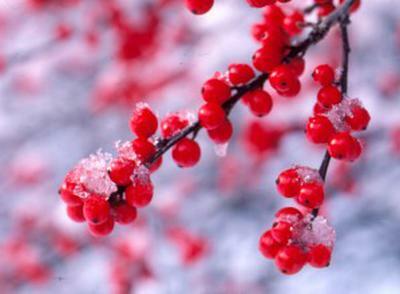 An extremely popular bush that adds color via its abundant “berries” is the Winterberry Holly. The foliage on this bush stays a deep green, and offers a bright red berry in the winter months. Take note you’ll need to plant at least one male in close proximity to a female to enjoy the berries. There are 2 ways to look at bark, first for texture, and second for color. For texture you can explore such varieties as the American sycamore, River birch, American beech, and paper birch. These verities all offer bark with great texture. When it comes to colorful bark think about adding the Salix “flame” willow, coral-bark willow, or the red-osier digwood which offer deep red or coral shades of bark. Four season perennials such as ornamental grasses, hellebores, myrtle, or dianthus can add beauty to any landscape. Never cut your ornamental grasses in the fall, not only do they look fantastic when they become snow draped, but they also bring the birds in. Hellbores, & myrtle offer deep shades of green, and you might even see the tiny purple flowers from on your myrtle. Make sure you concentrate on “non-plant” focal points as well. Make use of your summer decorations in the winter. Window boxes, hanging baskets, and or any winter hardy container can be used. Use them to plant small evergreens, hollies, or anything that offers winter color or texture. Use lights to line a walkway, or spotlights to highlight winter interest. You can even use birdfeeders to bring in colorful birds. So as you can see winter doesn’t necessarily mean an end to your beautiful landscape. So when you’re planning, planting, and buying containers or lawn decorations in the spring, summer, and winter months, always think about your winter landscape. This entry was posted in Gardening Tips, Homeowner, Landscaping, Uncategorized and tagged Colorado, Evergreen, Garden, garden care, Garden hose, Ilex verticillata, lightweight garden hose, Picea pungens, Plant, Shrub, TUFF GUARD The Perfect Garden Hose, Willow. Bookmark the permalink.